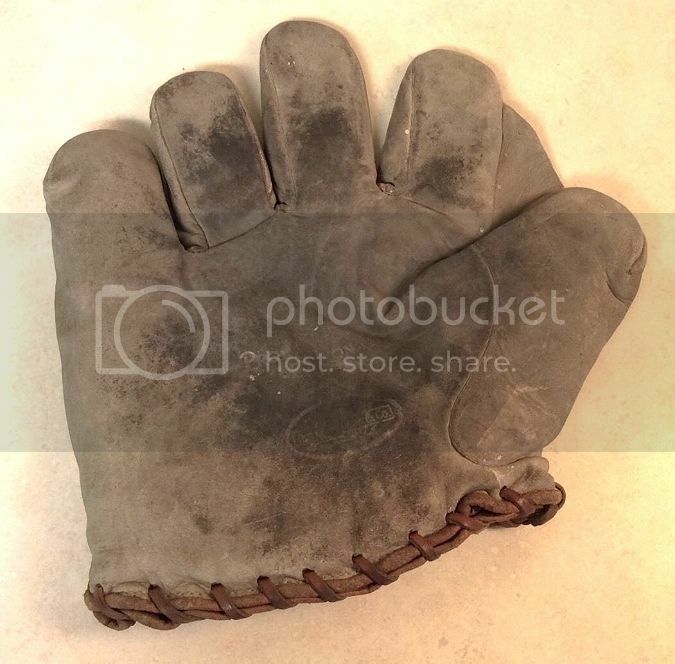 A near mint "Billy Herman" model 636 glove from ebay. 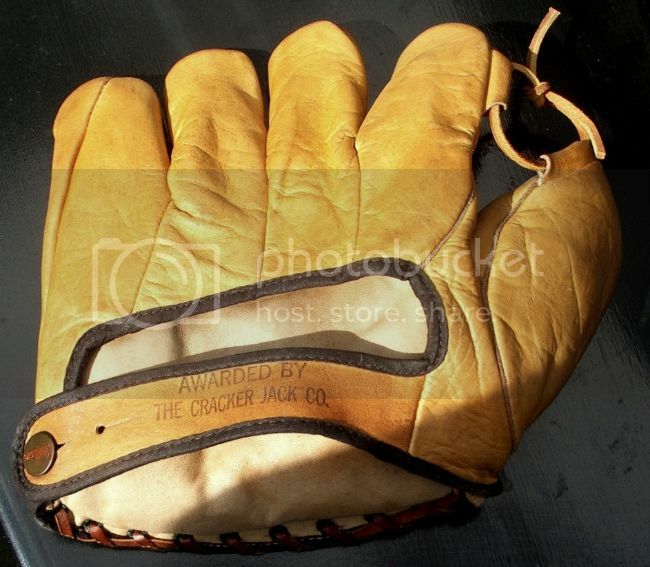 It has an interesting "Cracker Jacks" stamp on the wrist strap indicating a mail in premium of some sort. 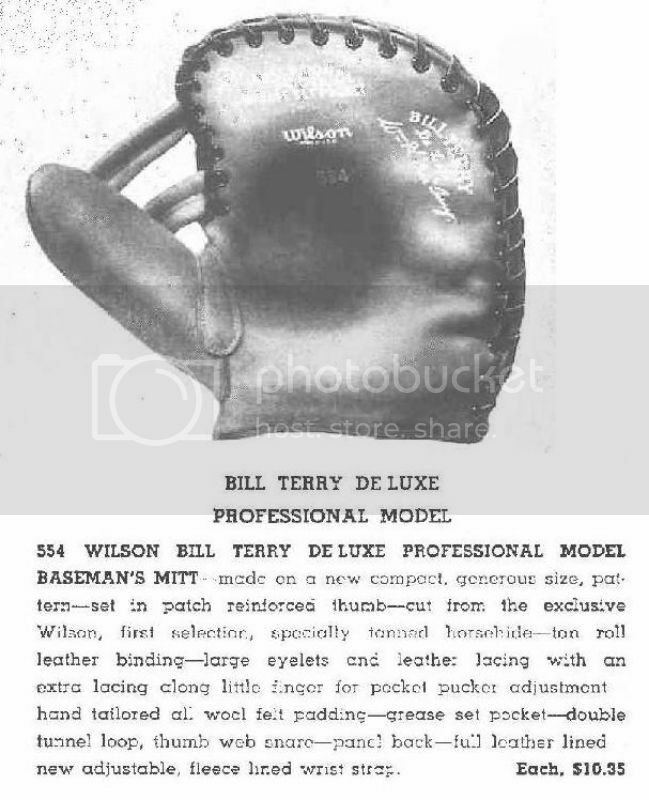 The following is an interesting chronology of the "Bill Terry" model base mitt. 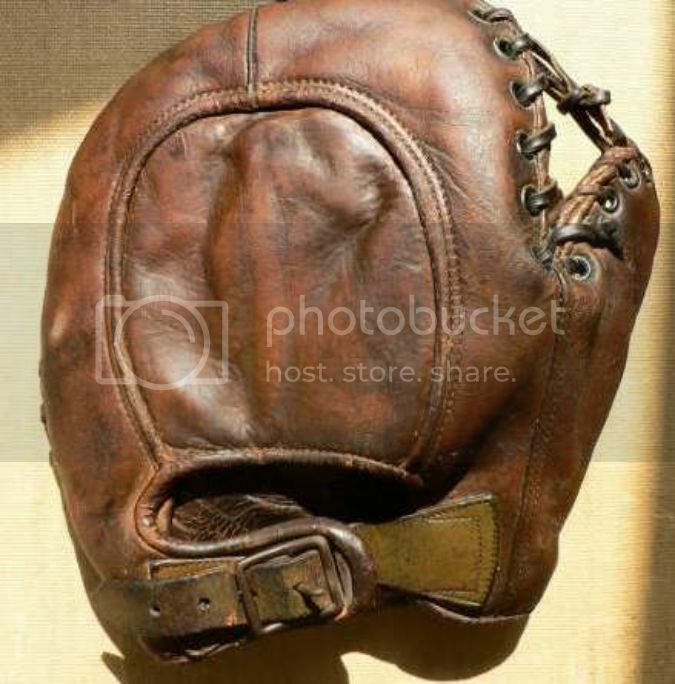 There were several "generations" of the mitt beginning in 1927. 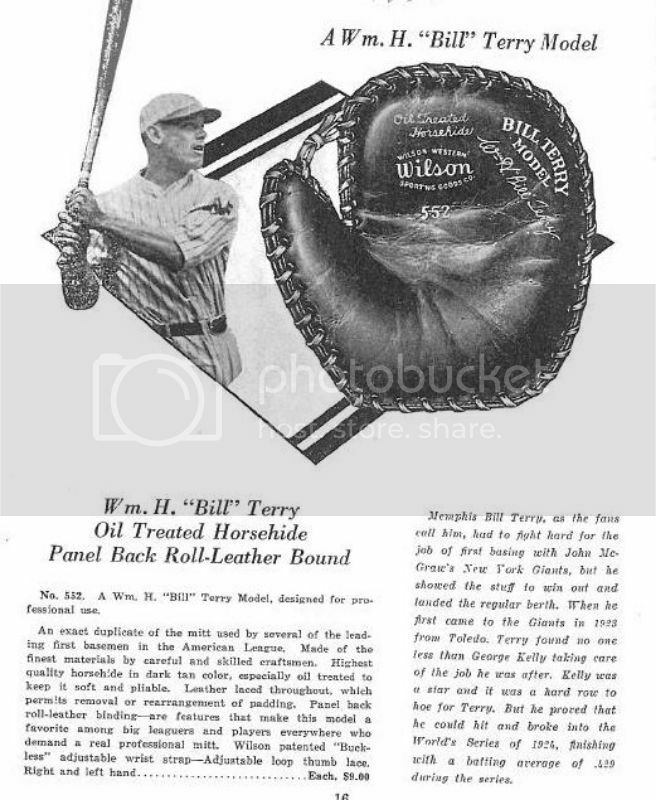 Bill Terry came into the league in 1923 and by 1927 was a star player. 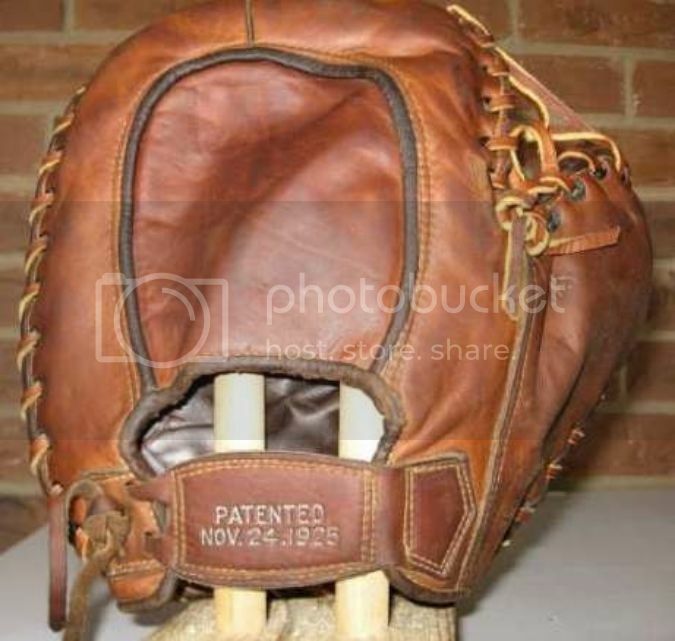 The first generation mitt featured the newly patented "buckleless" web strap and an adjustable tunnel loop web lacing. 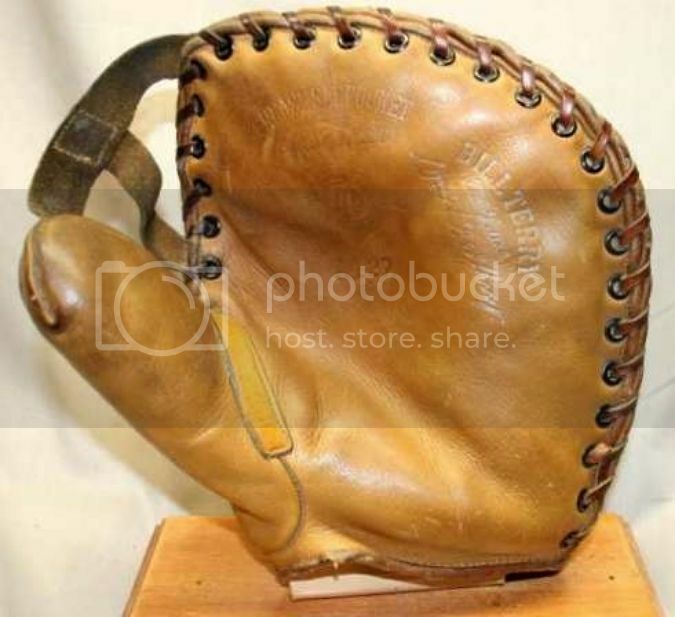 These first mitts were also "glove thumb" models, meaning the thumb portion was sewn onto the mitt much like a fielders glove. 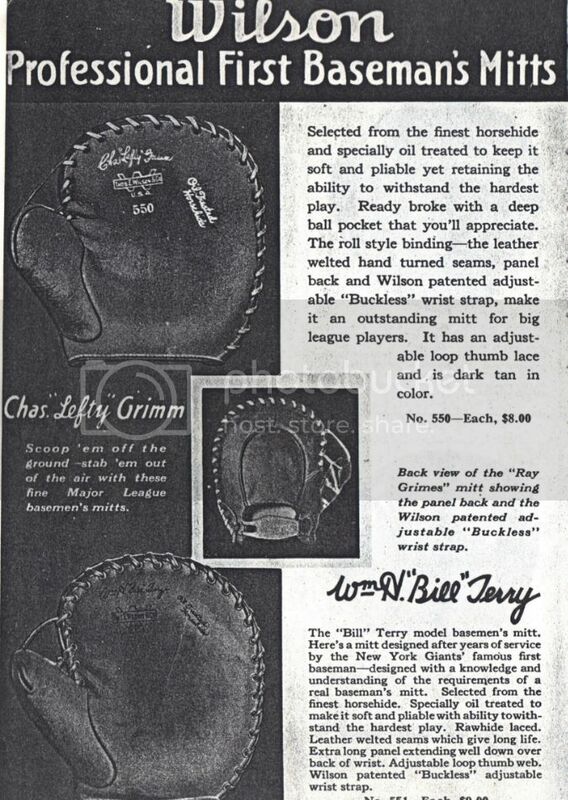 Below is a catalog page from a 1927 catalog. 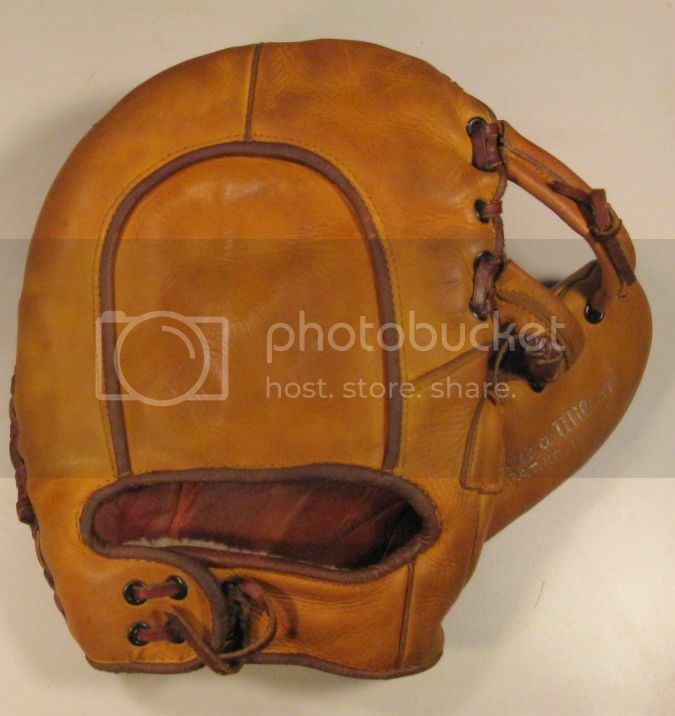 This circa 1927 Horace Partridge model below was made by Wilson. it's cool how the wrist strap is above the wrist opening. 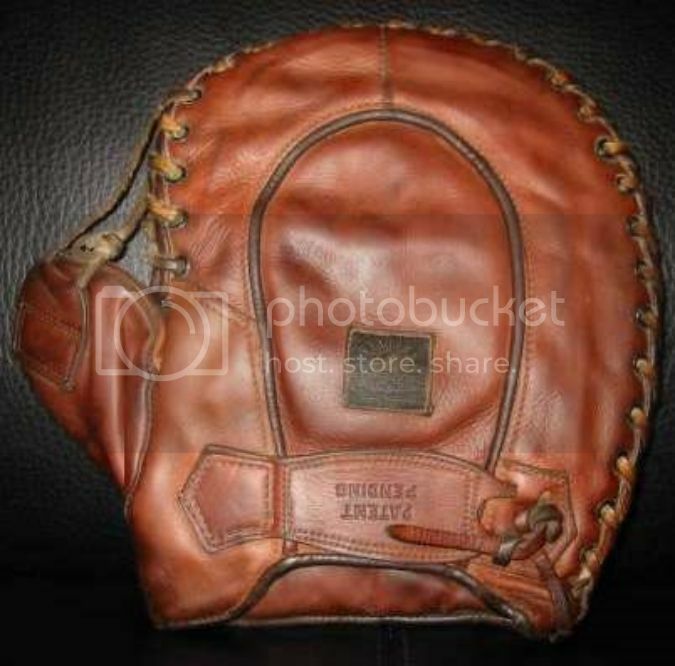 The second generation mitt was introduced in 1930 and was identified by a one piece face and full perimeter lacing. 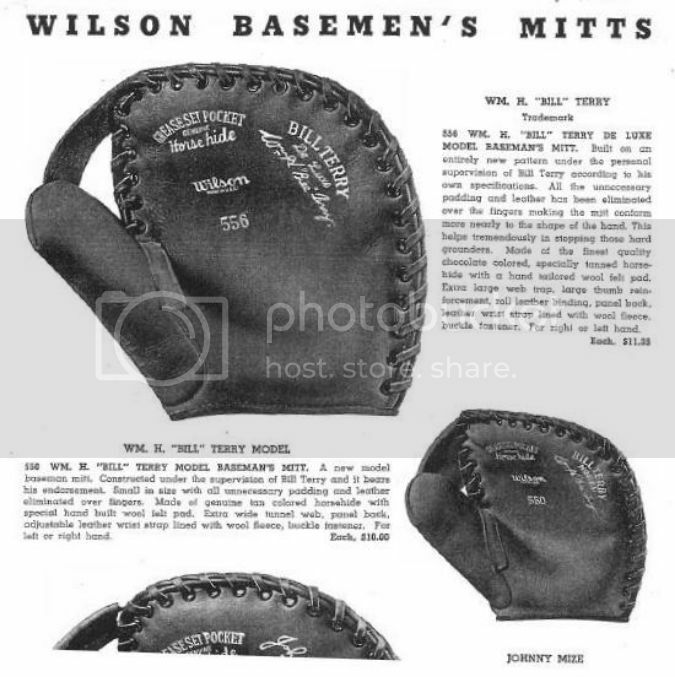 The "Bill Terry" model was the only mitt in the Wilson catalog with the full perimeter lacing and was that way for a number of years. The wrist opening was larger on the later models, allowing the strap to cross over the wrist itself. The third generation was introduced in 1933. 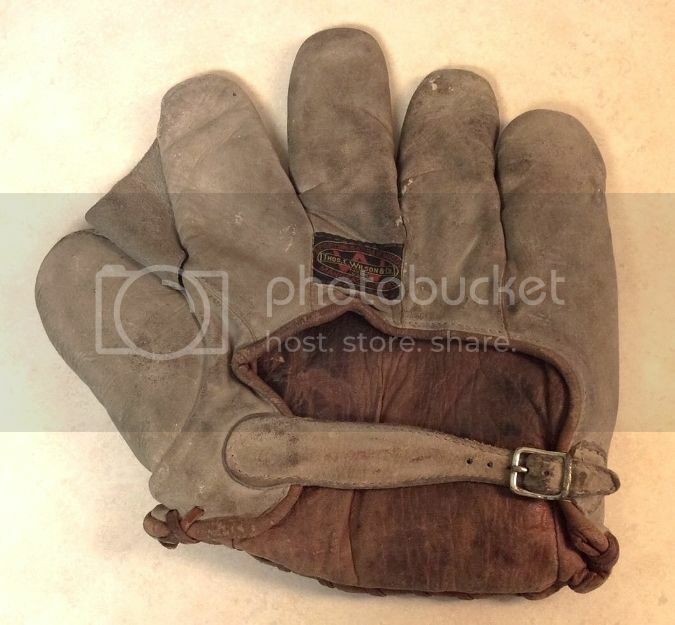 The full perimeter lacing was kept and the "buckleless" laced wrist strap was replaced with a typical buckle and strap. 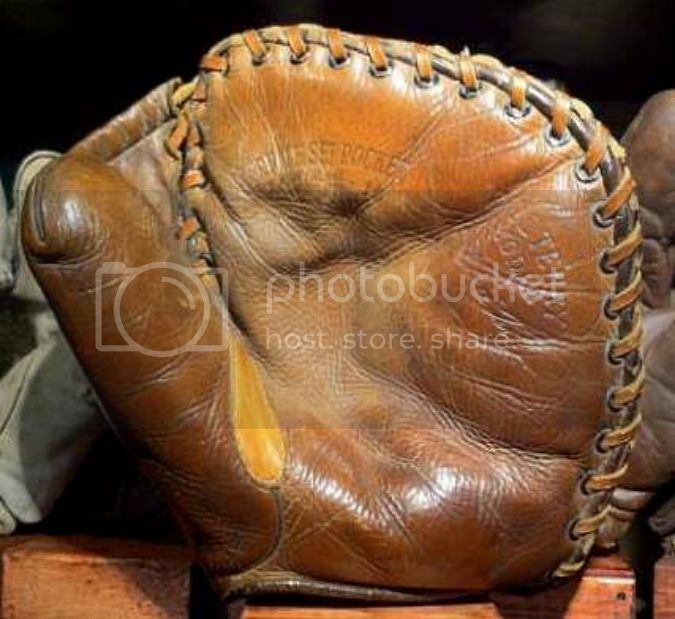 The fourth generation was introduced in 1937 and two "Bill Terry" models were featured, both abandoning the full perimeter lacing in favor of the "glove thumb" design. 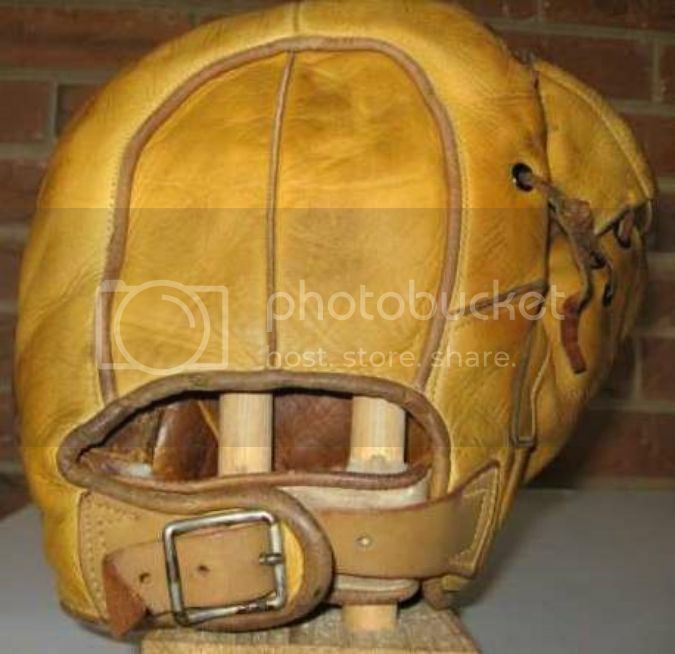 The model 556 at the top had a strap web and the model 550 below had an extra wide tunnel webbing. 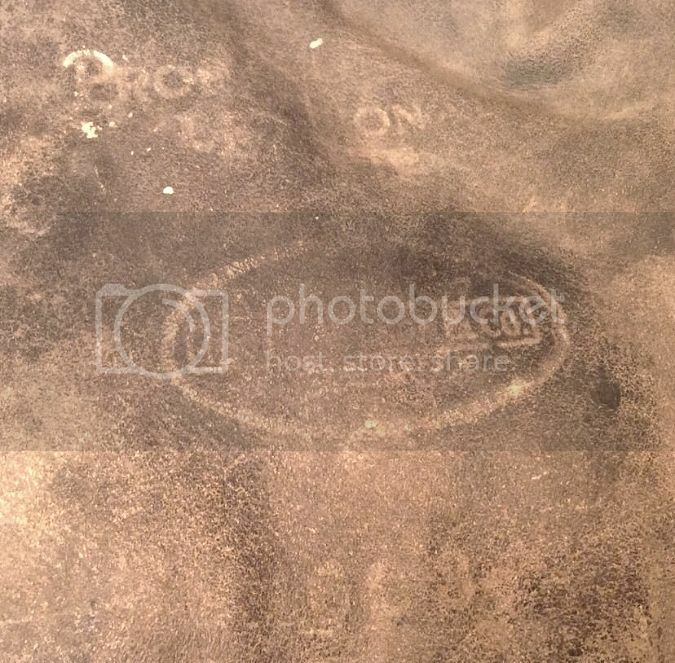 The model 550 also was radically shortened with a squared off top. 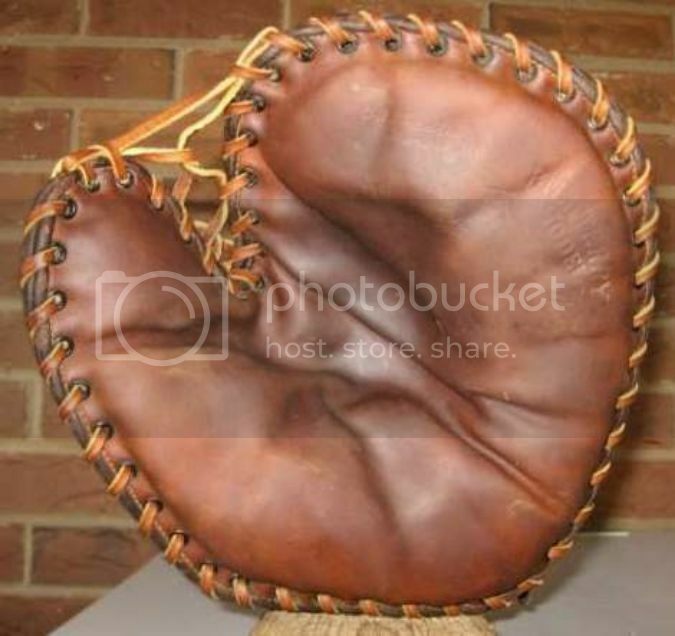 Terry designed this mitt to be smaller and just the size of a hand for better ball control. The fifth generation was introduced in 1939 and featured a double tunnel webbing and a redesigned laced wrist strap. There was also the cool "pocket pucker" adjustment. 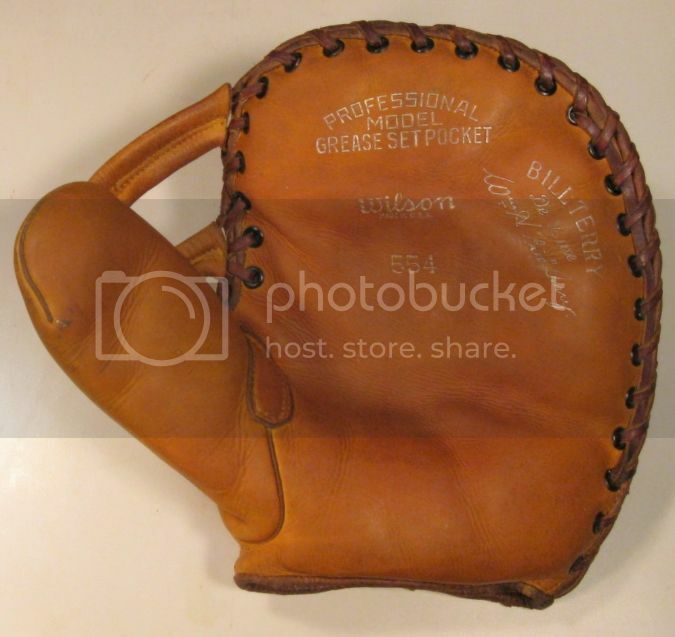 An early buckle back, full web model 603 "Professional League" glove possibly from the 'teens into the twenties. The offset buckle and tapered strap really gives this one a vintage look. 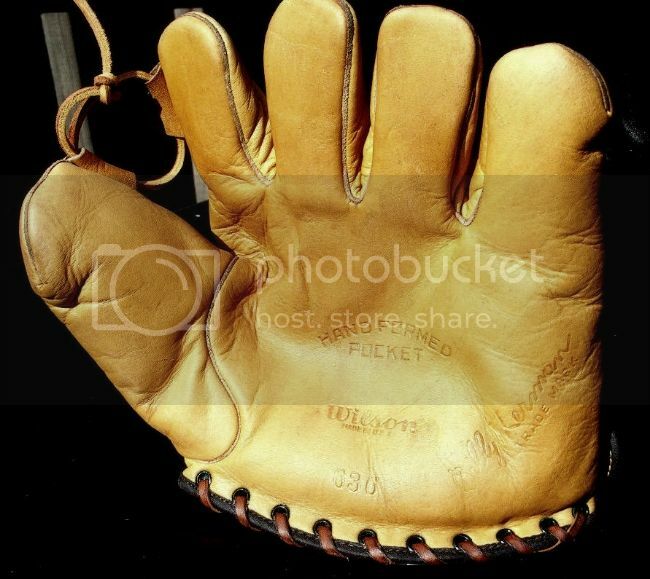 Soft light grey colored leather, great early Wilson oval logo patch and super markings on the front not often found on a light colored Wilson glove. 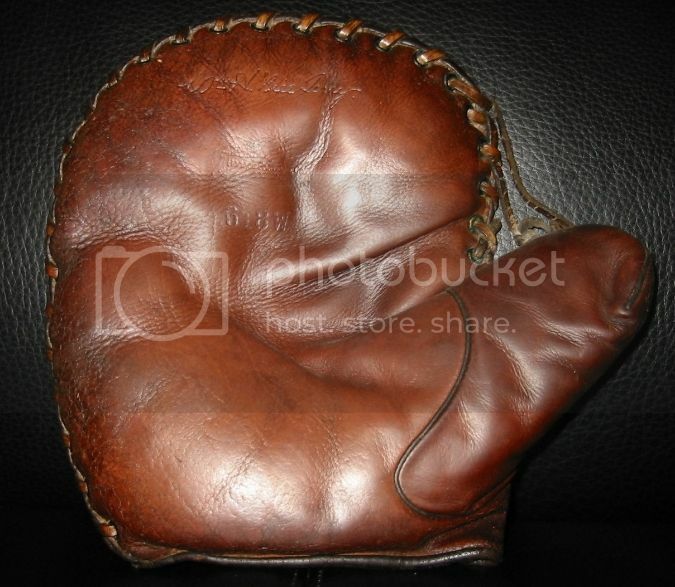 A top glove in its day and in remarkable condition. A rare find!